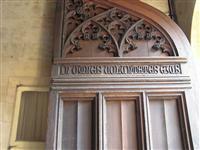 Over the main entrance of the Cavendish Laboratory, the home of the Department of Physics in the University of Cambridge, is an inscription: ‘The works of the Lord are great; sought out of all them that have pleasure therein’. This use of a Bible passage in architecture is somewhat unusual for a university physics laboratory that was built in 1973. The passage was placed there at the suggestion of Andrew Briggs, who was a PhD student at the time. Briggs is now Professor of Nanomaterials at Oxford University. 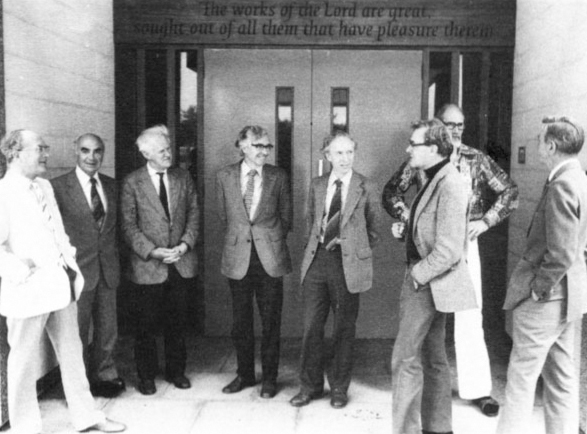 He appreciated the Latin inscription of Psalm 111 verse 2 carved on the doors of the first Cavendish Laboratory, almost certainly at the instigation of the first Cavendish Professor, James Clark Maxwell. He suggested that it should be put up, in English, at the entrance of the new building. This is a great example of how open minded Cambridge science departments can be, and their willingness to recognise the Christian heritage that was so important in the development of modern science. It’s also an example of what a student can achieve if they put their mind to it. Many thanks to Professor Briggs for helping me with my research on this story.